Do you always leave the best till last; the pork crackling, the lamb bone; the gooiest bit of pudding? I do, and that’s what we’ve done with the last episode of Baking Secrets. It’s Lazy Baking and it is just my thing! So much fun. So tune in for my favourite quick tips and handy hints in this episode to help ensure high impress, low stress easy baking. When I had my café in Northbridge Plaza in 1989/90, one of the most popular things on the menu was our scones with thick cream and jam. The first person in every morning would put on the coffee machine, turn on the oven and make a big batch. Well now you are going to learn our secret – but I have added to it and figured out how to do caramelised pear on top but all in the one action and bake. It’s just as well I made my no knead bread with olive oil, peppered with spicy chorizo and Murray River pink salt before I visited my old friend Michael Klausen at Brasserie Bread – now with homes in both Sydney and Melbourne. Not that mine is not fabulous and easy but because when I was there, I learned the traditions of artisan baking: how important it is to take time, care for the sourdough starter (now 18 years old and made from organic unbleached wheat flour, spring water, Murray River salt and malt), retard the rising for long proving, hand shaping the bread, slashing and then baking on a stone hearth to get an award-winning end product (see http://www.sydneyroyal.com.au/87.htm). It is all this which gives their sourdough bread its complex flavour and crumb structure – taking three days of love for every loaf. 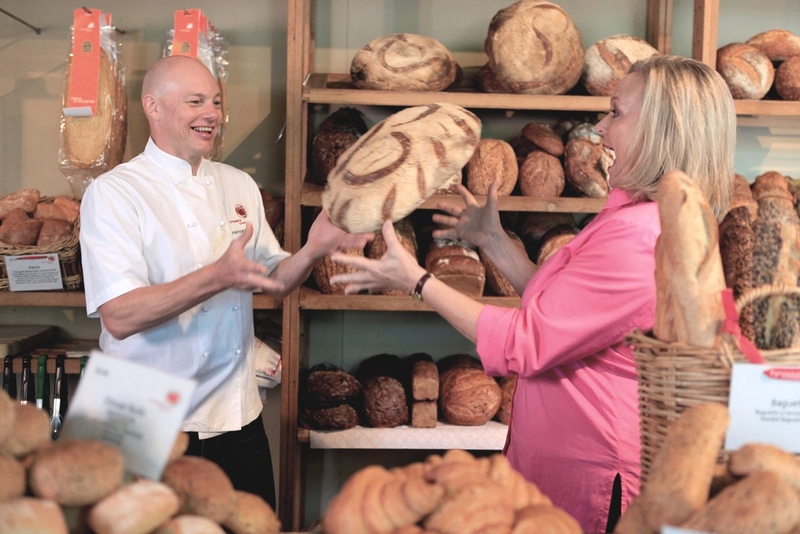 Michael has been successful for years and last year won both the Champion Sour Dough or Artisan Style Bread Exhibit and the Champion Organic Bread Award for his Boulot – along with a swag of other medals for his other products. Fresh sourdough, straight from the oven! What is most amazing is how much he gives back. Brasserie runs “Breaducation” classes, which are free for kids. They learn about what goes into good bread, get to knead it, bake it and best of all, eat it! There are also classes for adults and industry. Another highlight was Tobie Puttock joining me in my kitchen. He is such a delight, funny and shared his father’s Fruit and Nut Torte, a cinch to make but a joy to eat! Of course we used my favourite Raspberry Ice KitchenAid mixer to whip the egg whites. Then everything else was simply folded through. Tobie is Melbourne-born and met and became great friends with Jamie Oliver when they both worked at renowned River Café in London. A top chef in his own right he was Head Chef of the first Fifteen Restaurant in London. More recently he’s made his own e-books, complete with step-by-step videos for you to follow. ($2.99 each from iBooks/iTunes). He is an absolute star and I had some fun with him in how to line a cake tin. I think I have converted him to my cheat’s way. 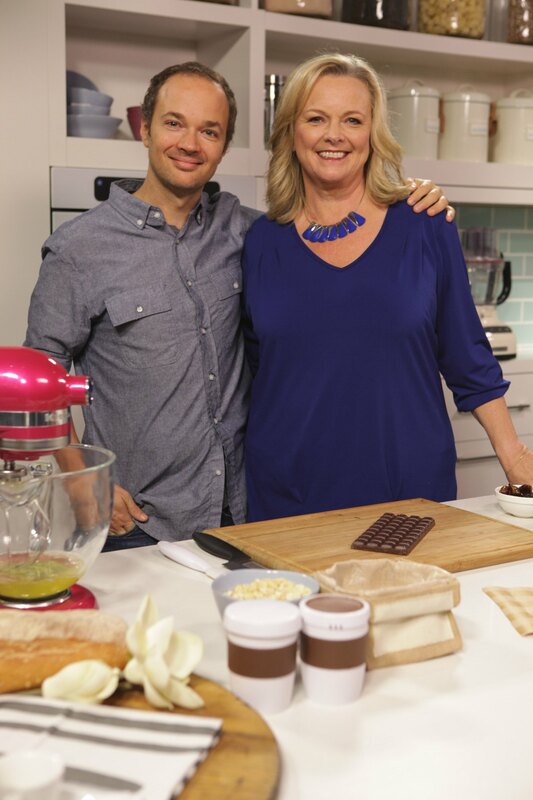 Of course I share another secret in this week’s episode – a short cut to tempering chocolate to make chocolate bark! This episode brings my Baking Secrets to an end – though it will be repeated many times in the week. Next thing to look out for is my Taste of Australia cookbook (Hardie Grant) which will be in all good bookstores in September. 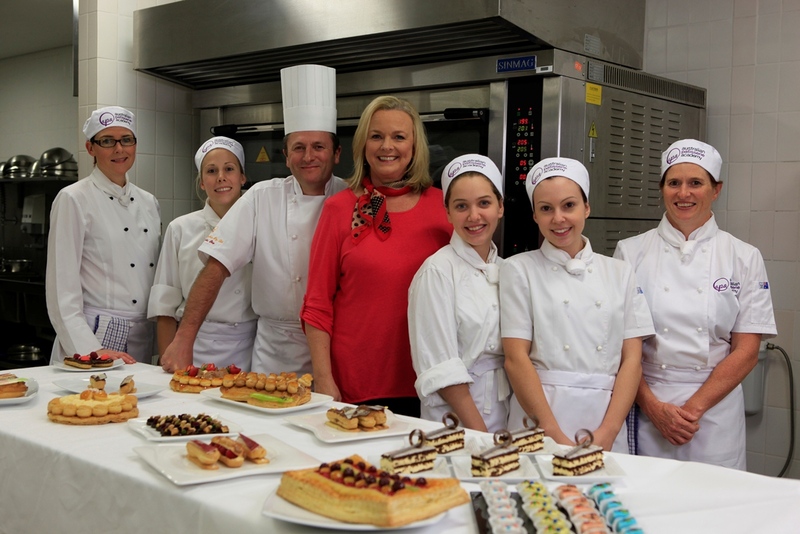 This episode of Lyndey Milan’s Baking Secrets airs on Foxtel’s LifeStyle Food Channel on Monday 18 August at 8.30pm! Don’t forget the encore episodes, Tuesdays at 12:00pm & 5:00pm, Saturdays at 9:30am & 8:00pm and Sundays at 12:30pm & 6:30pm. Hi Carol! Thank you for your comment. You can find the recipe for Tobie’s Fruit and Nut torte by clicking here. Enjoy! Thanks for watching the series! 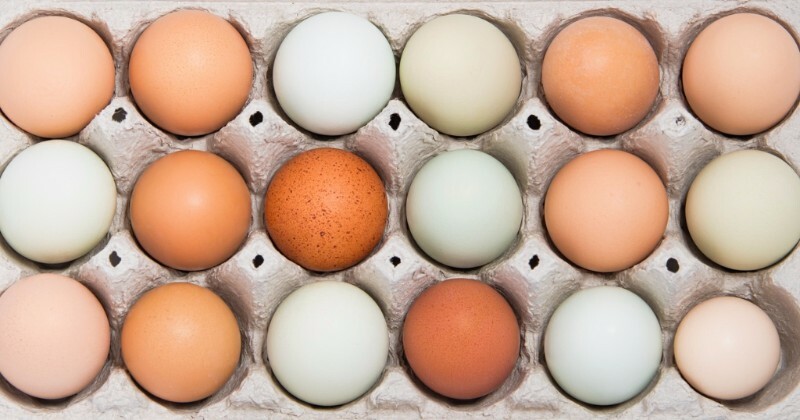 You can find Tobie’s recipe by clicking here. Thanks for watching, we hope you enjoyed the series! Really would like lyndeys scone recipe and Olive oil and chorizo bread please. 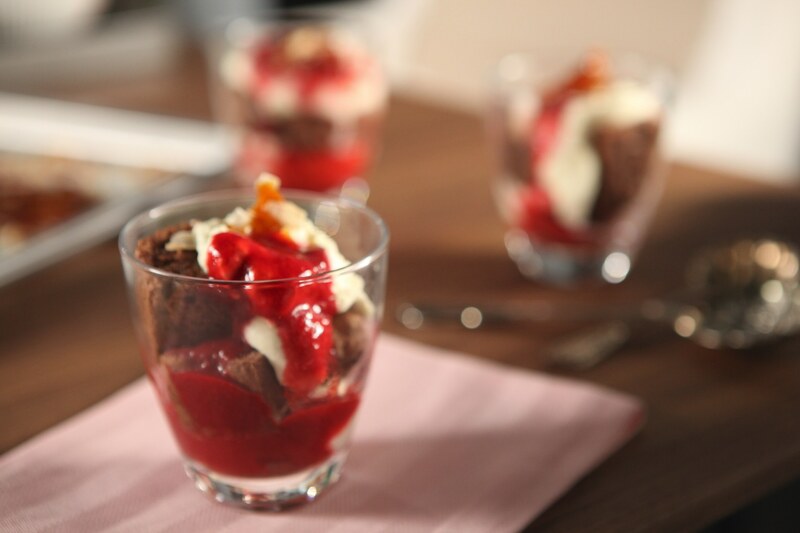 Hi Debbie, the recipe can be found here – thanks for watching the show! Hello Lyndey. I love watching you cook on TV. You make scrumptious recipes. One recipe I am interested in is the Spiced Orange Cakes which was aired on 18th August, but didnt give exact quantities of some ingredients. Is it possible you could please send it to me. Thank you. Thank you for your comment! You can find the recipe for the Spiced Orange Cakes by clicking here. Thanks for watching the show!! Hi Sarah, thank you for your comment. I’m afraid the Tobie Puttock recipe for the Fruit and Nut torte is no longer available online but you can purchase it by buying his e-book, “10 Old-School Dessert Recipes with Tobie Puttock”, (from Tobie Puttock Videocok Series, Penguin).